Sen. Al Franken (D., Minn.) has apologized after being accused of sexually assaulting a woman and later groping her while she was asleep in 2006, although he said he did not remember all of the events "in the same way." KABC anchor Leeann Tweeden posted her story on the radio station's website on Thursday, writing that Franken aggressively kissed her without consent during a rehearsal for a skit for troops during a USO tour in the Middle East, which Franken headlined. Franken was a comedian before entering politics. She also included a photograph of a smiling Franken grabbing her breasts while she slept on the flight home from the tour. 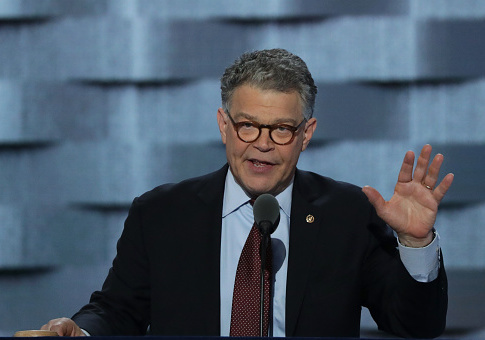 "I certainly don't remember the rehearsal for the skit in the same way, but I send my sincerest apologies to Leann," Franken said in a statement. "As to the photo, it was clearly intended to be funny but wasn't. I shouldn't have done it." NEW Stmt from @SenFranken: "I certainly don’t remember the rehearsal for the skit in the same way, but I send my sincerest apologies to Leeann." Tweeden wrote that she avoided Franken for the remainder of the trip, but the story for her did not end there. She described how she boarded a C-17 cargo plane and fell asleep for their flight home. In a photo she included in her account, a smiling Franken looks at the camera while his hands appear to touch Tweeden's breasts through her flak vest. "I couldn't believe it. He groped me, without my consent, while I was asleep. I felt violated all over again," Tweeden wrote. "Embarrassed. Belittled. Humiliated. How dare anyone grab my breasts like this and think it's funny?" Tweeden said that she did not realize what happened until after she was home and going through CDs given to her by the photographer of the trip. "I'm telling my story because there may be others," she wrote. In the past two months, a wide variety of prominent men like Harvey Weinstein, Kevin Spacey, and Alabama Senate candidate Roy Moore have been accused of sexual assault and misconduct. Weinstein and Spacey's careers have crumbled, and Moore is facing pressure from his own party to step out of the race. The revelations have led more women, and some men, to reveal their accounts of abuse at the hands of powerful figures, some of them from decades ago. This entry was posted in Politics and tagged Al Franken, Congress, Democrats, Sexual Harassment. Bookmark the permalink.